I used to go to Rosemont on Monday mornings but now, because of the replacing of that trash day with a compost day, I have to go elsewhere. I decided to go to Outremont which has trash day on Monday and Thursday. 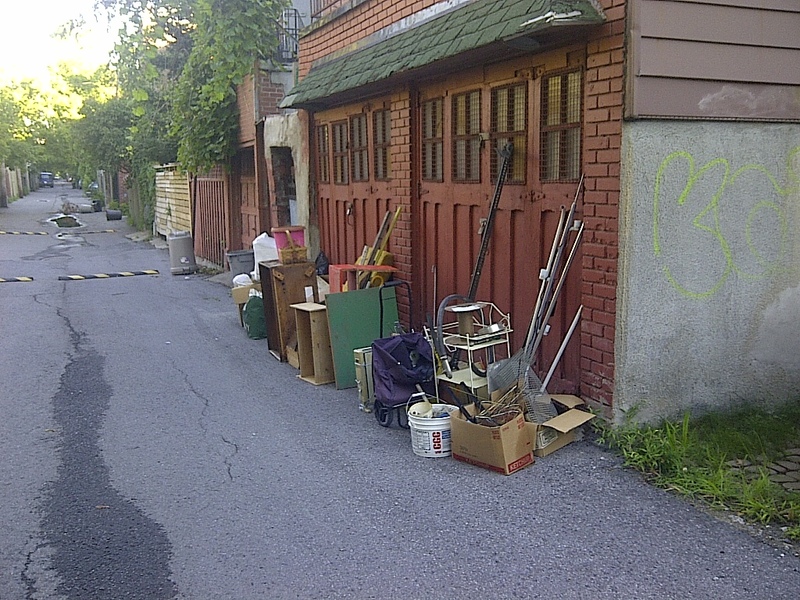 Outremont is a richer neighbourhood but it’s lower population density makes it harder to find trash. I came across this pile pretty early on in the journey. I think this stuff had been in one of those garages for a long time and much of it got pretty damp and mildewy. There were a bunch of old letters sent from the Philippines to a doctor most of which were sent in the 1980s. I would guess most of this stuff had been there since that time, maybe a bit later. Most of the stuff wasn’t worth taking but I did find this cool necklace and pendant. They’re both marked “Ster” (sterling silver). I think there might be a piece missing on the back, but that might also just be a an optional thing in case you wanted to put a photo in there. 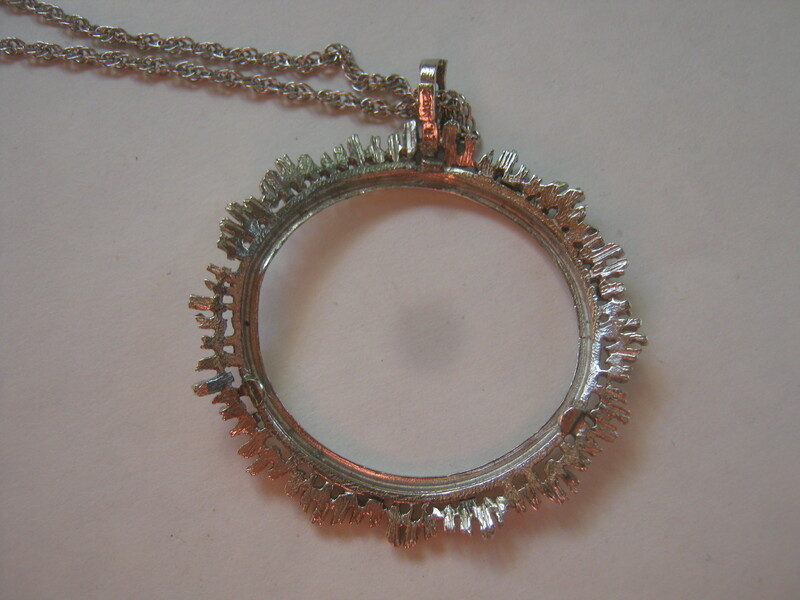 Regardless, it’s a pretty cool piece, it looks a bit like the sun don’t you think? 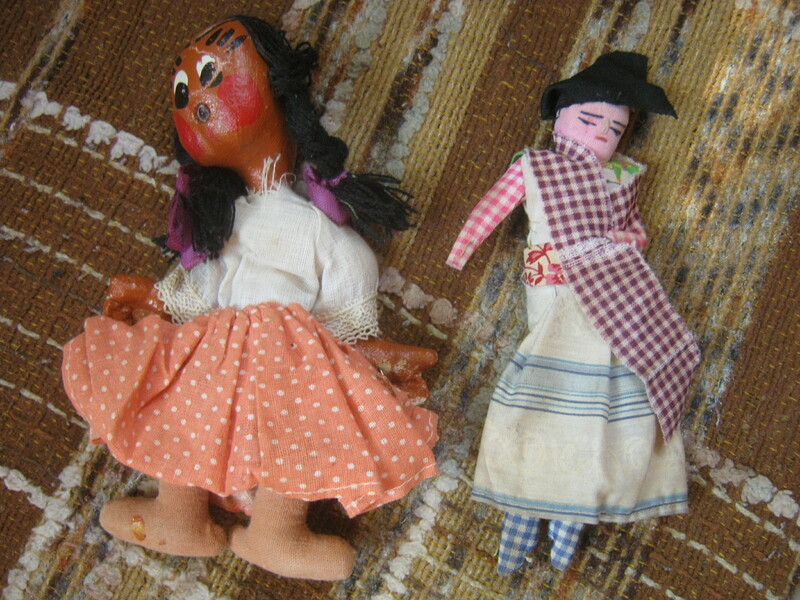 I also found these two dolls which were in decent shape. They’re pretty weird though, neither of them look very cheerful that’s for sure! Does anyone who what cultural background these might have? I saved these DYI jewelry / toy / birdhouse kits from someone’s trash bin. All but one have never been opened. These should sell quickly at a yard sale. Other than that there wasn’t too much. I like biking around that neighbourhood, though, and I did find a chokecherry tree (one of my favourite local fruits!) which was cool. Here’s the last of the little pieces I found the other day. A lot are pins, many of which are missing the pin, but others have flat backs. There’s lots of different insignias, many of which are probably military. I’ve found out what a few are, but any information you have on the others is appreciated! The pieces come from a wide range of places, including corporations, schools, non-profits, secret societies / fraternal organizations and the army (read the comments on my last few posts as some commenters helped me identify a few!) so I doubt there’s any real limit as to what they could be. The main unifying concept is that they’re all American, mostly centred around the northeast states. 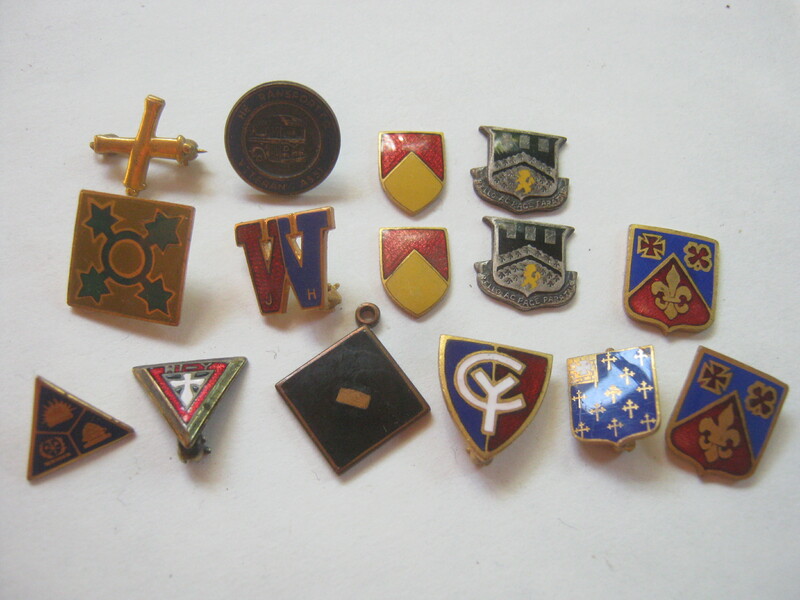 The Kiski pin probably refers to the Kiski all-male boarding school. Wells Lamont is a company that makes gloves while the now defunct Van Norman Co. made big machines tools used in industry. The dark shields on the middle right which feature the phrase “Bello Ac Pace Paratus” (Prepared in Peace and War) are the insignia of the US Army’s 112th Engineer Battalion. I couldn’t figure out which way was up for the red pin second from the left on the bottom. It looks kind of like it reads “Hi Y” but I’m not sure. My guess for the “C.H.C.” pin is that it was made for the Calvert Hall College, a Catholic private school in Maryland. The shield marked with the phrase “Summo est opportunitas” (seize the opportunities) is the insignia for the US 106th Air Refueling Squadron. 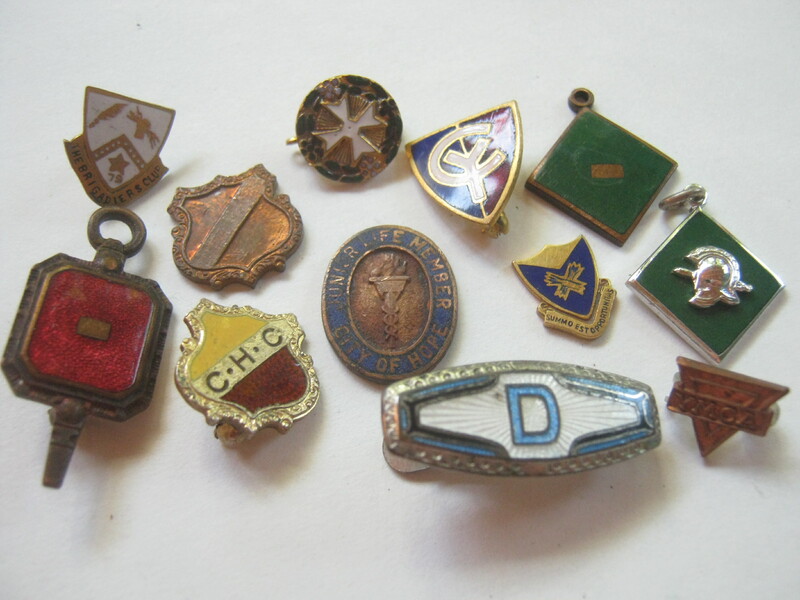 The iron cross pin at the top looks could be for St John’s Ambulance. The little football pendant has “Navy” written up by the top, I’d guess it’s from the Navy’s football team. 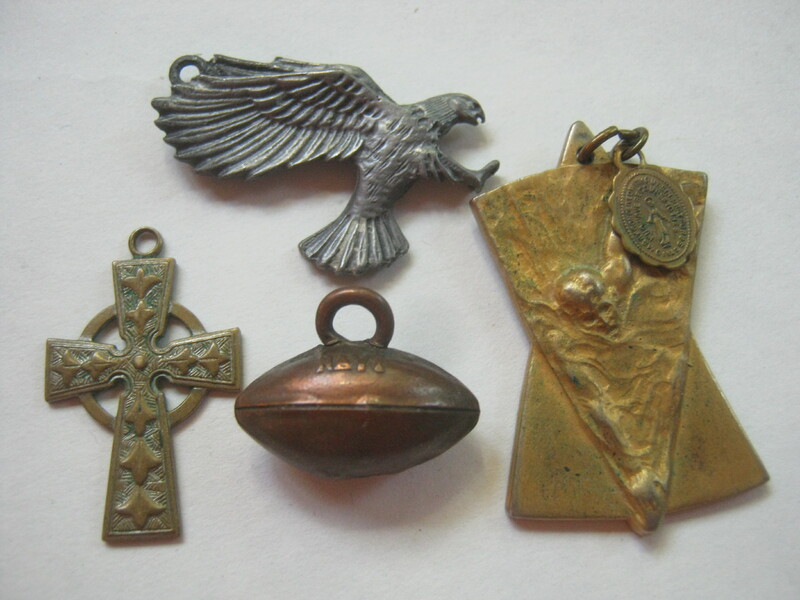 The pendant on the right which looks to have the image of a man swimming has a little catholic medallion attached at the top. 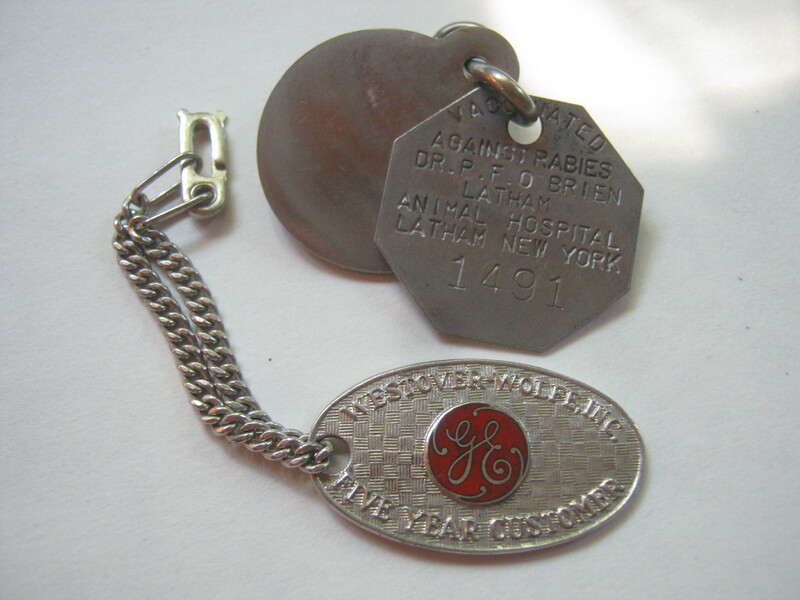 On the medallion is the date 1880, though I don’t know if that’s when it was made or when the quote was said. It looks kind of old regardless. I think the hawk is made of pewter. 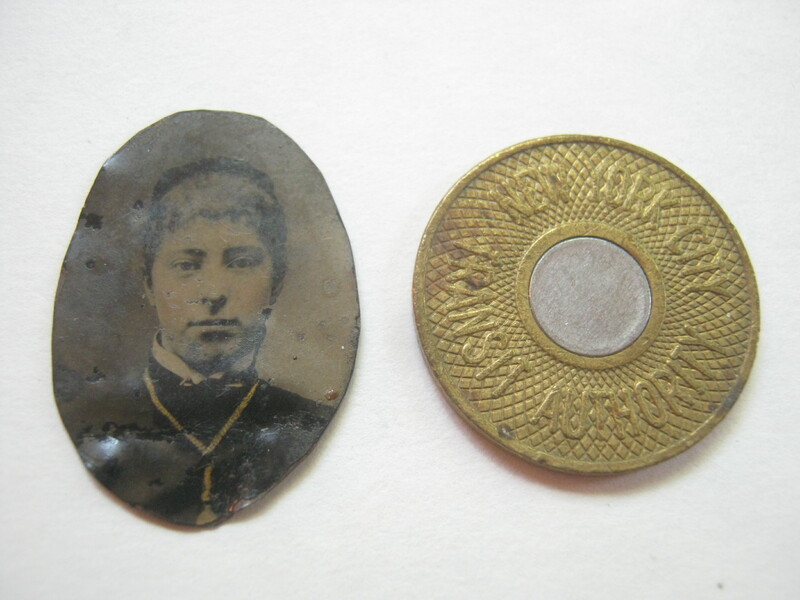 Here’s an old “tin type” photograph next to a New York transit token (which is a bit smaller than a quarter). I love those old tin types. 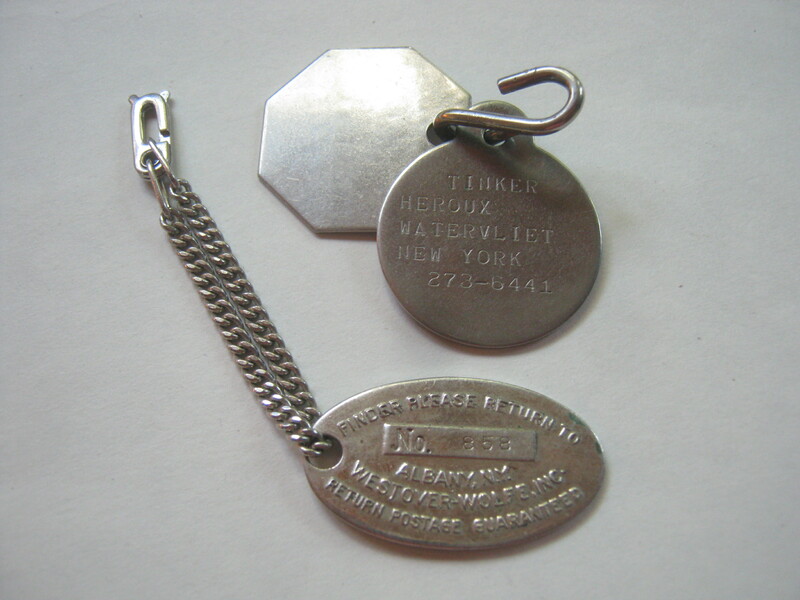 Finally, a pair of old dog tags (for an dog, not a soldier this time!) and 5-year customer appreciation keychain (?) from GE. I’ve really enjoyed looking through all these bits and pieces. I should be able to sell the military-related ones pretty easily, some of the others I may end up putting in the yard sale. However I might end up stashing a bunch away, especially the mysterious ones and hope that one day I can find someone who knows what they are! Oh, I also found out what those tiny “US” button-like things from a couple of posts ago are: they’re the centres of American Legion buttons. Thanks to the “What is this thing” community on reddit for helping me figure that out. I should do a bit of organizing as I still have bits and pieces lying everywhere. I may go out to the Plateau later for trash but I might also just skip it and save my energy. I haven’t made many good finds there in the last little while. I’ll be going to Villeray tomorrow morning regardless. 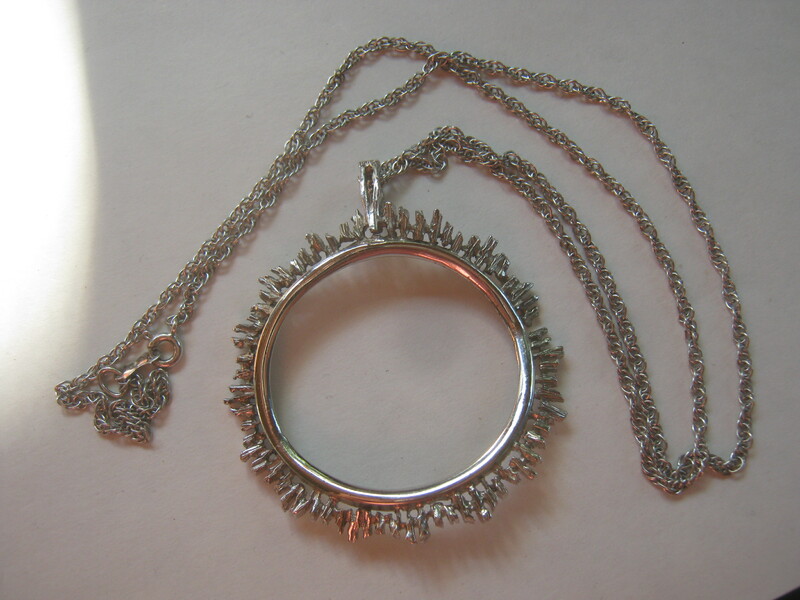 That silver pendant looks lovely, even without the missing cameo (or whatever was held in place by those back clips). It’s hand made and quite artistically done. Is there anything on it other than the Ster? I’m sure someone would be happy to buy it as is, from your etsy store. Here’s a link on dating photos through clothing and hairstyles – http://www.olivetreegenealogy.com/photos/fashions-photos.shtml (there are many such sites). I hope you find out where the dolls originate. You may want to try your “What is this thing” community for information. The one of the left looks like it could be South American. They’re charming little dolls. Hey Martin~Great post, love your whole mission here, and I really hope you get some kind of grant from Canadian Patrimony ministry or Heritage Montreal because what you’re doing is important, and is of much historical/cultural/ecologic value. I know it must get to be a bit of a slog sometimes out there on your bike in the mornings or whatever, but I’m sure you’re inspiring a lot of other armchair preservationists just like me! Keep up the great work, and please do let me know about your next garage/yard/corner sale so I can come look at your spoils and say Hi in person. Cheers, and thanks again for the posts. It can be sometimes, though a cup of coffee usually helps. I think I’m getting better at picking my spots instead of trying to cover as much ground as possible, which I think has provided me more finds of late. As long as I make a few cool finds a week I stay pretty happy. I wonder if I could apply for a grant, it could be something to look into. I’ll definitely be having a yard sale soon as I have to move for the end of the month and would like to have to move as little as possible. I’ll try to let you guys know with a post when it happens. Those two dolls are very quaint and would be loved by collectors.You should go to Outremont more often.It is loaded with money.You could find many treasures there.Outremont is a very small borough,with only 24,000 people and can be easily covered by you on bike in its entirety. Money doesn’t mean good trash hauls! 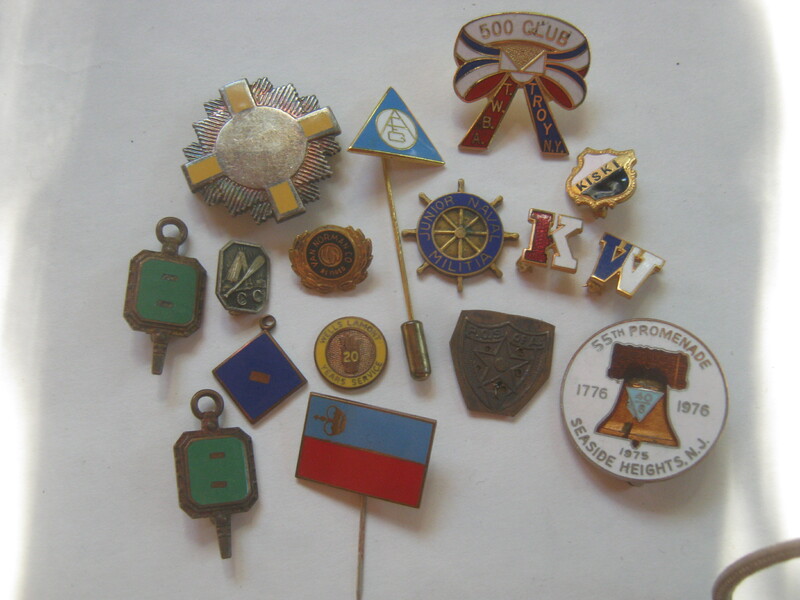 You must have found over 200 great insignia,metal pins and similar artifacts in the last 18 months .You have a particular talent for detecting insignia,medal pins and such memorabilia in the trash.I wonder why so many people throw out cool memorabilia in the first place–these things do not take up much space. I have a friend who knows a bit about dolls, will try to get ahold of her and ask about those dolls. hi, I would be pretty sure you have a “doll collectors” club in your city, google it. these folks are as intense as any other collector…..seriously. b) you could send them a pick and say it is “for sale”, and ask them to pass on to members.. But also, since you found the dolls along with some random paperwork from the Philippines, seems like it would make sense that they might be from there? I love your blog.I have a few friends on welfare or disability allowance.They cannot afford to buy new laptops or desktop computers.Even the used laptop a friend of mine bought broke down after 4 months.Now he can only access the internet a few hours every week at the local library.Low-income pensioners and students could also benefit from working but free or very cheap used laptop computers.Where is a good place to look for discarded functional laptops?Please report on this and help low-income people access vital internet access in this high-tech era. Laptops don’t generally land in the garbage. I’ve found only three, two this year, one maybe a decade ago, and they were each in pieces. FInd a place that deals in computers, and maybe their garbage would have some, but not likely. A lot more electronics stuff is going to ecycling, and even if you find one outside a computer store (one of the three I did find there), it’s likely not in full working order, and may actually have a problem. I’m not even finding as many desktop computers in the garbage as I previously did. I’m not even seeing many laptops at garage sales. On the other hand, the “classified ads” have plenty of laptops, maybe more than desktop computers. They aren’t dropping to dirt cheap, but they are cheaper than new, and considering I spent $150 on a 200MHz Pentium in 2001, $200 for a much better laptop is pretty good, except if you don’t have the money. The good news is that computers have reached a stable condition, you can keep on getting something better, but the bare minimum (that you need, that you can easily get used) is really quite a good computer. So the laptops keep their price (rather than dropping off to ten or fifteen dollars like I could buy older Macintosh laptops at one point), but they also are quite useable. There was a long period when the old computers you found at garage sales and even in the garbage were quite limited because they ere old. Lots of stuff comes off lease but I don’t see that kind of computer being available in single quantity. 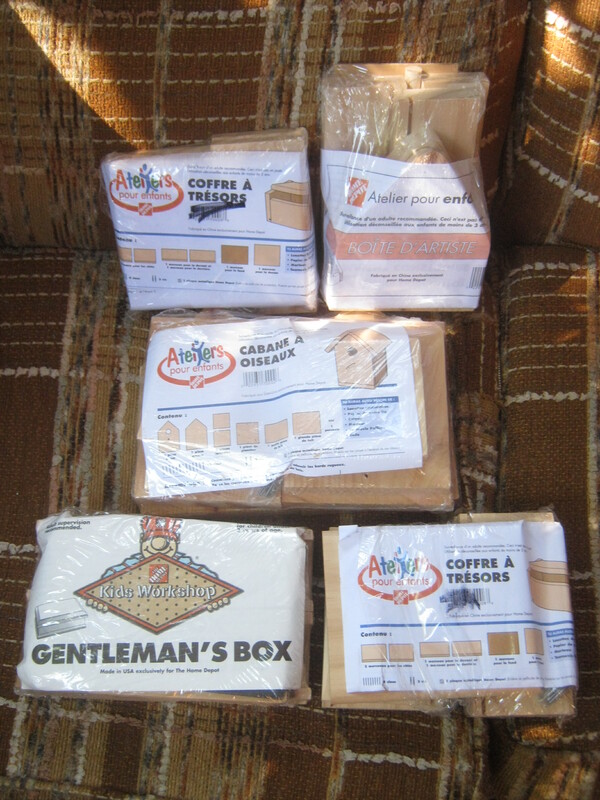 They seem to be bought up in bulk by refurbishers, who will sell you a working product with a guarantee, but which is priced like buying used from some individual. Again cheaper than new, but priced high enough to be a problem if you don’t have money. It’s different if someone has the technical skill, but even I’m finding it difficult, some cases you can’t open up easily on the sidewalk, and there often isn’t an indicator from the outside of “how good” the computer is. So I’ve bought home desktops that weren’t better than what I already had, and at least once, left something that was better, simply because I couldn’t tell from the outside the vintage. Ultrasoft Innovations in Montreal West On Westminster just up from Sherbrooke Street) has been selling laptops for at least 25 years. For a while (maybe still) Richard was giving away older laptops, but they wouldn’t be useful with wifi, let alone recent software. But, that might be a place to check, he has done various community minded projects over the years, so if he was getting ahold of newer but less worthy laptops, perhaps they’d be available. He does have offers on older laptops (relative speaking), though again he’s refurbishing so they aren’t dirt cheap. If someone lives in a less residential area, perhaps there is wifi available at home. if someone lived above a McDonalds in Verdun, for instance, they’d get wifi via the restaurant, though I don’t know if there’d be lmitations on that wifi access. There are now plenty of stores and restaurants that offer free wifi, not perfect but it’s there. So someone located near such a hotspot could get wifi access with a desktop (so long as they get a wifi card or USB wifi thing), though best to actually test this before looking for a desktop. The difference is that the desktops can be had at a lower price than the used laptops, and one can still find some desktops in the garbage or at garage sales. I agree with this. I’ve found a couple of laptops but all have had issues. One is the one I use (in complement to my desktop) and it was in pretty good shape and just needed a hard drive and an operating system. The monitor is weird sometimes, the cable is a bit wonky. Regardless, I found this in front of someone’s home once so it was a sort of random thing. You’re more likely to find a desktop computer, and like Michael said it’s much harder to find them these days (though I found one earlier this summer that worked perfectly fine).